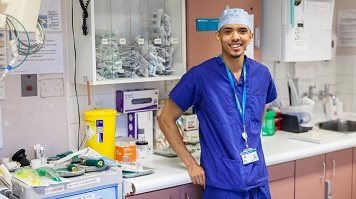 Mehnuhlik Lynch studied for a BSc in Operating Department Practice at London South Bank University (LSBU) between 2014 and 2017 and now works as an Anaesthetic Practitioner. I have always had a passion for working in healthcare. During my teenage years, I qualified and worked as a Pharmaceutical Healthcare Advisor and that was where my drive for working in healthcare started. I decided to study this course because I wanted to pursue a career working in operating theatres and have an active impact on providing specialised care to patients in need. I decided to study at LSBU because of its excellent reputation in Health and Social Care and its links to world renowned hospitals in the London area. It was a challenging decision to make, as I had to leave my hometown of Luton and move to London permanently to study. I haven’t looked back since. All of the lecturers who taught me in my course were absolutely wonderful, but I especially wish to express my sincere gratitude to Jackie Kent and Chris Mahoney who were pillars of strength and support throughout my studies. My training qualified me to work as a theatre practitioner in three different specialist areas, anaesthetics, surgical scrub and post-operative care (recovery). Since August, I have been working as an anaesthetic practitioner in a South London NHS trust. This entails working alongside consultant anaesthetists, assisting them in their day to day anaesthetic duties and providing high quality holistic patient-centred care. I originally found out about the job through a mutual friend who was already an operating department practitioner. The skills required to work in the perioperative environment are diverse, and include being able to manage a patients’ airway, understanding and performing correct patient positioning, checking the functionality of anaesthetic and surgical equipment, and also preparing and being responsible for medicines including controlled drugs. Alongside these are sets of non-clinical skills that I demonstrate every day such as having situational awareness, good communication skills, team working and knowing my own limits. These skills are just as vital within my role as the clinical skills are. Theatres can be a scary place for most so being able to give emotional support and reassurance to my patients alongside their treatment is what I most enjoy about my job. There is no such thing as a typical day in this role. I could start the day working in paediatrics with children as young as a few weeks old, and by the afternoon be re-allocated to an emergency theatre to help a patient coping with a life-threatening condition. In all, the diversity and patient care is what makes me like this job more and more each day. The daily challenges of my job are what keep me motivated. No two days in operating theatres are ever the same, and each day there is something new to learn. An unexpected emergency can happen at any time and require me to adapt my planning and care at a moment’s notice to ensure the best outcome for my patient. In the next five years, I see myself in a management role as a theatre divisional manager, and I intend to further my academic studies in order to achieve this. The most important thing I’ve learned since graduating, that has helped me in both my personal and professional life, has been to be open-minded and teachable. Always look to learn something new. You can contact Mehnuhlik by email or visit his LinkedIn profile.